These words reflect a rebellious time in my life during the late 80’s when my wife and I took that suggestion literally and decided to go “walkabout”. We were bold enough to sell our house, quit our jobs and take our two children out of school to embark on a nine month odyssey throughout Australia and the South Pacific. Personally, one of the most memorable parts of that trip was the four weeks we spent exploring New Zealand in a rented RV. Just like nomads with no permanent abode, we were able to travel the length and breadth of both islands in comfort and style. Our home-on-wheels allowed us the freedom to stop where and when we wanted to, cook our own meals and move on at our own pace. In retrospect it also cost us a fraction of what it would have cost to stay in hotels and eat in restaurants every day and the added bonus was that we never had to pack or unpack. We just simply had to turn the key and head out on the highway! Fast forward 25 years and I’ve just finished setting up for the evening at Ben Eoin Campground located about twenty minutes south of Sydney (Nova Scotia not Australia). The clothes are put away, the beverages are cold, the camp fire’s lit and we’re sitting on the sandy beach listening to the waves roll in. It’s déjá vu for me except this time I’m taking a five-day golf trip in an RV with my son-in-law who is also an avid golfer. A marriage made in heaven despite the fact that we’ve both left our wives at home this time. Recounting stories of my earlier adventures and listening to his tales of my new grandson made for easy conversation and a great first night ‘on the road.’ Instantly I knew this golf trip would be like no other for both of us. Next morning we packed up and sauntered ten minutes down the road to The Lakes Golf Club that opened in 2010. Canadian Architect Graham Cooke designed this picturesque layout to nestle right alongside the Ski Eion hills. There’s definitely a Muskoka-like feel to this course with its tree-lined fairways and numerous elevation changes. As a word of caution, the greens are big, roll true and are in perfect condition so remember, you’re playing on ski runs and everything slopes to the water. 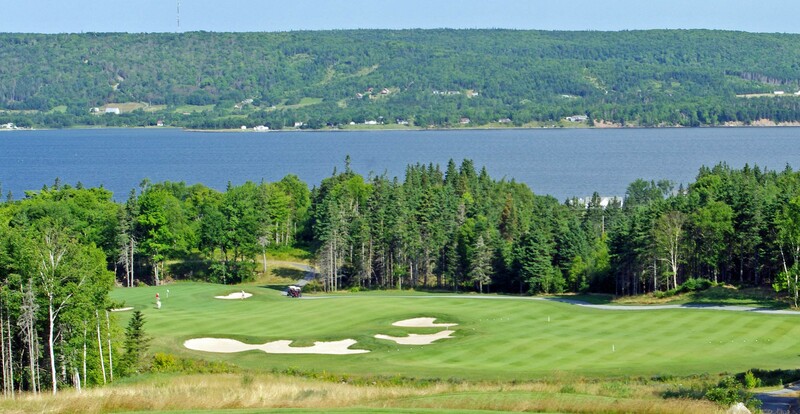 The sixth tee is the highest point on the course with a spectacular view of Bras d’Or Lake so bring your camera. I loved this course but the best was still to come. After our game we took a brief tour of historic Sydney then drove about three hours along the eastern portion of the Cabot Trail to Ingonish Beach. We were both taken aback by the sheer beauty of the Atlantic coast and were pleasantly surprised at how well our two-ton behemoth handled the many curves and steep inclines. That night we settled in at the Cheticamp Campground, part of the Cape Breton Highlands National Park which covers over 950 square kilometers and boasts more than twenty-five hiking trails for exploring massive tracts of this protected land. Definitely on the ‘to-do’ list for next time especially after we got our first glimpse of a cow moose and her ‘small’ calf rustling in the bushes near our campfire. Scary but very cool! Come morning we found ourselves only minutes away from our next game. Opened in 1941, Highlands Links definitely stands up to the test of time. Designed by the legendary Canadian Architect Stanley Thompson, this course stretches about two and a half miles through hilly, forested land and is consistently ranked among the top 100 Courses in the world by several leading golf publications. It is a true honor and privilege to play such an historic gem but don’t expect any level lies here. There are a few flat spots on the fairway but I swear by the swells on the second green that there’s two humpback whales buried there. I also discovered what may be the softest and deepest sand bunkers I’ve ever played so I’ll be sure to practice up before my return. From here we drove inland until we popped out at Pleasant Bay on the western shore with magnificent views of the Gulf of St. Lawrence. After our two and a half hour spectacularly visual journey we pulled into the McLeod’s Campground just outside of the Acadian village of Cheticamp. Reportedly the waters here are the warmest north of the Carolinas. Beach, BBQ and Beers! It doesn’t get much better than this. Nearby Le Portage Golf Club offered a nice layout with views of the Cheticamp Highlands but I didn’t find it quite as photogenic nor as well manicured as some of the others we had played. The fairways were very dry and the bunkers are pebbly with some rocks. May be it was just having a bad hair day! After another picturesque two hour drive, the golf gods ‘blessed’ us with a cool overcast day that was foggy, drizzly and raining – ‘nasty’ weather but we certainly felt like we were ‘on the moors’. Now we’re near the tiny hamlet of Inverness (Nova Scotia, not Scotland) and are about to play Cabot Links, one man’s vision of “If you build it they will come”. 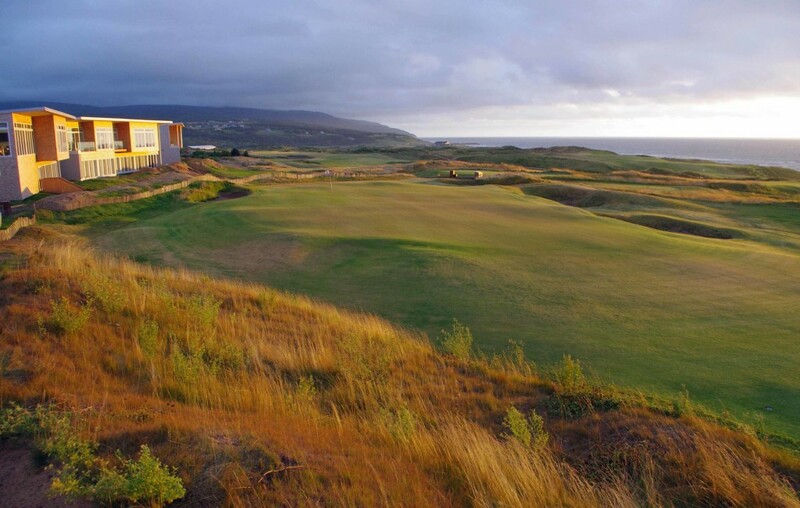 It’s here that owner Ben Cowan-Dewar commissioned architect Rod Whitman to design Canada’s only authentic links course on the site of an old coal mining operation. 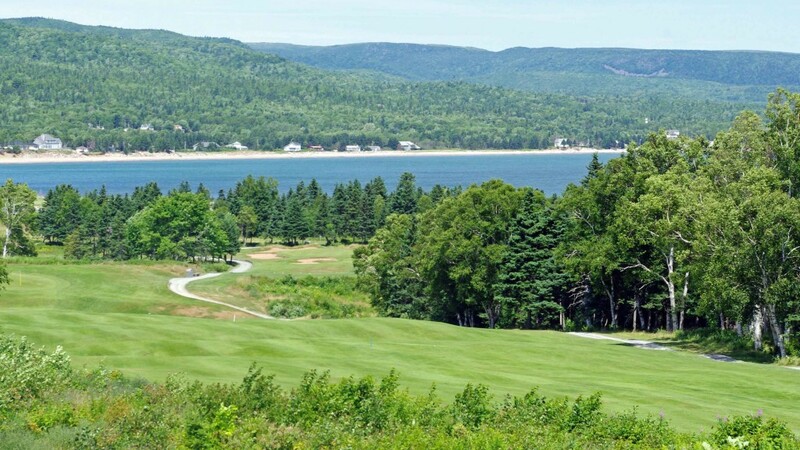 He responded by rendering a stunning 18-hole par 70 that includes five holes that play directly along the coastline and every other hole has a view of the Gulf of St. Lawrence. In June of 2012 this was the most widely anticipated golf course opening in North America and I can see why. Not only is Cabot Links stunning, it’s challenging. There’s fescue galore and huge greens that average over 45 yards deep and so, they actually allow you to take pull carts on greens. That was a tough thing for me to do but not as tough as negotiating the 4th and 13th which come together to form a double green that is 110 yards wide and where I made my best three putt ever! If you’re like me and enjoy a “wee dram” then let me suggest that you make a slight detour and visit The Glenora Inn & Distillery, reportedly North America’s first single malt distillery. 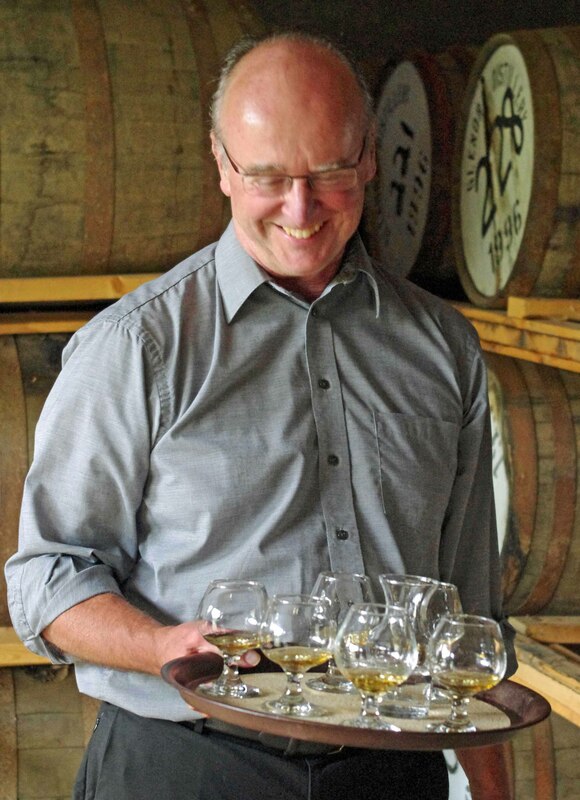 After two bankruptcies and a six year long battle to be able to use of the name Glen, this company has recently won the “Best of the Rest” at the International Spirit Competition. It proved to be an absolute treat for me and another golden opportunity to introduce my son-in-law to the finer things in life. 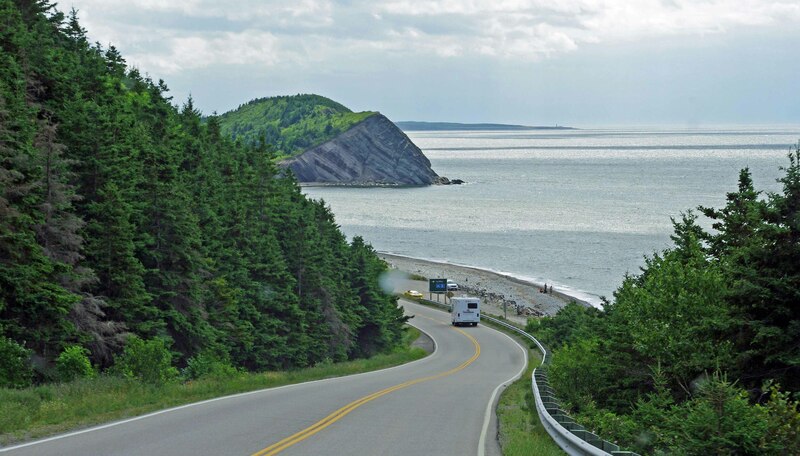 The Cabot Trail has longed been revered as a great road trip but did you know that Cape Breton was recently rated #1 Island Destination in North America and #3 in the world by Travel & Leisure Magazine. The Lonely Planet calls it “one of North America’s best road trips” with its winding roads, stunning landscapes, breathtaking views and tranquil beaches. Now add in the heritage and hospitality of Scottish, Irish and French (Acadian) who settled here along the road from Ingonish to Inverness and the Cabot Trail becomes an amazing “golf trail” – bar none. Really enjoyed the article. Great job. Wonderful trip. Thank you Loretta. I’m glad you enjoy reading my article. Great story, Dave! 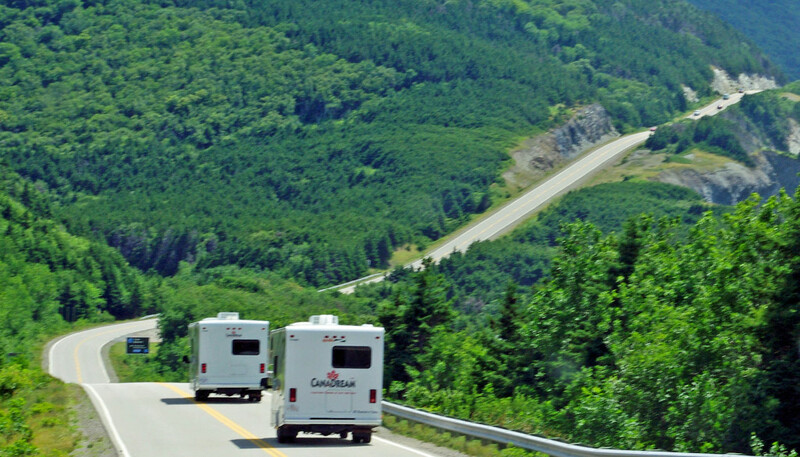 You really captured the adventure of the open road. 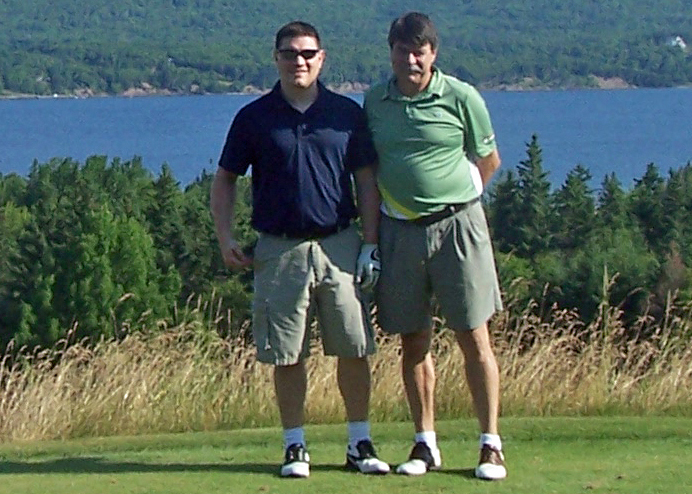 It made me want to go back to Cape Breton…even though I don’t know one end of a golf club from the other!